One of the most important parts of the business moving process is finding the right moving company to assist you with your move. There are a lot of differentiating factors that go into picking a moving company to assist you in moving your business and it's important that you sit down and carefully consider each of these factors after every mover that you meet, to decide on the one that will ultimately be taking your move and your business into their hands. The key to a successful business move is making sure that the move disrupts as little actual business time as possible. With all that goes on during a typical move, this can admittedly be difficult. That's why it's the truly skilled moving professionals that are so valuable to this process and it's also why it's important for you to always ask your movers questions, especially before the move, so you can make sure that all of your bases are covered before you get off the ground. This guide will provide you with some basic questions that you should ask your movers prior to your business move, as well as some basic concerns surrounding most business moves and what you need to know in order to best prepare yourself and your business for your upcoming relocation. The first thing you are going to need to know about a mover in order to pick the one that is right for you, is the company's background. You should find out if the company is a member of the Better Business Bureau and if the company is registered with the U.S. Department of Transportation and the American Moving & Storage Association. Is your company registered with the US DOT and AMSA? What is your company's standing within the moving industry and with the local BBB chapter? Can you provide any references of satisfied customers? Is your company licensed for commercial moves? How about state and interstate transport? Perhaps the most important part of relocating your business successfully is making sure that your business continues to run, smoothly and undeterred, while the relocation is going on. Every minute that you have to close your business in order to handle the move amounts to money that your business can be generating for you and money that you are losing. Thus, making sure that the move doesn't hinder your basic everyday business functions that are vital to the operation of your company. That's why hiring a professional commercial relocation that specializes in moving businesses is important, because they know how to get the job done quickly and efficiently, without forcing you to sacrifice any of your precious business time. Here are some sample questions that you should ask your movers to make sure that the move won't get in the way of the most important thing: your business. Will this relocation allow my business to function normally while the move is taking place? Will the move take place during normal business hours, or after business hours so as to not disturb business operations? What kinds of businesses do you normally relocate? Are there any types of business relocations that your company specializes in? Will I need to shut down any business operations during the move, or will I be able to conduct business as I regularly do? 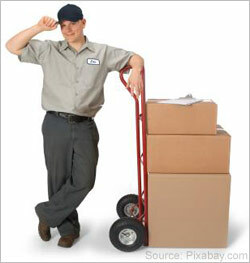 What kind of moving services do you provide that are unique to business relocations? What kind of inventory system does your company use for business moves? Finally, you're going to want to figure out what each moving company will offer you in regards to protection for your belongings and all business equipment during the move. That means inquiring about what kind of insurance and liability coverage that the movers offer and what kind of measures they plan on taking when moving your furniture and belongings out of your old office and into your new office. Your business equipment, furniture and devices are vital to the function of your company, so you're going to want a moving company that takes care of them and goes to the necessary lengths to make sure they are protected and arrive at your new office safely. Are workers covered by workers' compensation and public liability insurance? Was I given all necessary documentation, including the signed contract? Do you guarantee pickup and delivery dates? What happens if you miss one or both? How do you pack items with special requirements, such as electronics, glass-fronted furniture, antiques and musical instruments? Once you have all of these factors squared away, you can safely say that you have enough information to make an educated decision on which moving company is right for you and you will be that much closer to being ready for your moving day.